Ministry of Propaganda - 16/Mar/2005: "Holy Lego, Batman!" Wow, this is excellent: Batman: New Times (via Spinneyhead). 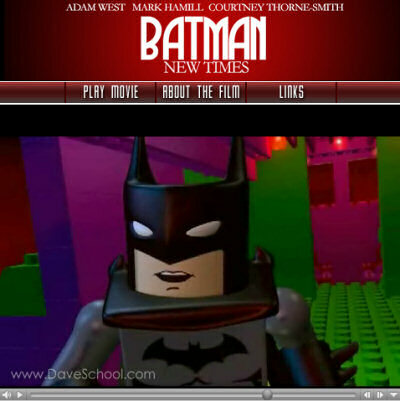 A computer generated 3D animation movie, pitting Batman and Robin against The Joker and Catwoman, with the actors and set based on Lego. Already fantastic, but they went even better with one coup: The voice for Batman was provided by Adam West, yes, the Adam West who played Batman in the 60s TV series. Made by the December 2004 Graduating Class of The DAVE School. Might take a while to download, but it's worth it. There's also a link to download the whole movie to your harddrive (86MB), so you can watch it again and again.